Missing Utopia - The End of Wardenclyffe! Copyright 2004 by Doug Yurchey. Reprinted with permission. One hundred years ago, the great scientist-inventor Nikola Tesla had high hopes for the success of Wardenclyffe and for humanity. His amazing power tower on Long Island, NY, aka a 'Magnifying Transmitter,' could tap into Earth's Electro-Magnetic fields. The energy flow of a turning planet could be magnified, converted into electrical power and broadcasted to smaller (wireless) sub-stations many miles away. At a time when few people could comprehend the new wonders of the inventor's Alternating Current, Tesla envisioned: radio, television, X-rays, lasers and wireless electricity. 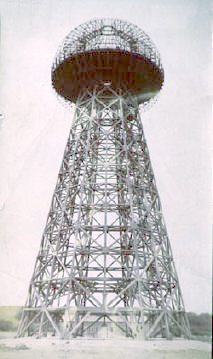 Tesla's tower with dome frame, completed in 1904. Tesla's Colorado Springs experimental lab was constructed in 1899. It was there and then when Nikola Tesla made one of the greatest discoveries of all time. What happened just prior to the 20th Century might have really been the greatest discovery of all time! His Colorado Springs tower proved that acquiring vast amounts of electrical power through the Earth was possible! Tesla knew that he could broadcast and WIRELESSLY distribute electricity in huge quantities at great distances. He combined radio and the AC Current. Tesla had just obsoleted his new, revolutionary AC by an incredible quantum leap! The Colorado lab paved the way for Wardenclyffe which was many times larger. Now it was possible that electrical power could be received very high in the atmosphere; up to the ionosphere. Electricity would seem to appear out of thin air; anywhere...at the bottom of the ocean or high upon mountains or on islands or at any point in the most remote regions. With a working network of power towers circling the planet, the lifeblood of Utopia is established. Power would be received through antennas; in vehicles, on roofs, etc., that tap into the wireless power grid. A network of power towers complete the grid and electrify the planet. We came so close to paradise in the modern age. 2005 will come and go and few people will ever truly realize the significance of the golden anniversary of a very special EVENT. Up until 1905, Nikola Tesla dreamed and worked toward a Wireless World. This super genius knew his discoveries would elevate people out of the dark ages. The most brilliant man in modern times pushed the envelope of what science or electrical engineering could bring to the world. Wireless electricity is the key. What wonders will eventually become realities when unlimited power is generated? Scientists, with their radical discoveries, have always lead the technological way and the general public follows and accepts leaps of progress. If teleporters to other planets were invented years ago, we would initially be overwhelmed by this fantastic technique. But, in time, we humans become accustomed to high-tech...like with radio and television. Soon, the fantastic becomes the mundane. We would get used to beaming to different planets. It would be as normal as making phone calls. Tesla questioned: How far could electricity take humanity? A Wireless World would UNITE the planet. What would his future look like after he terraformed society? A World Power Network Grid around the planet would tend to shrink the Earth and annihilate distance. There would be free phone calls. There would be free World Television. There would be an eternal fountain of power anywhere; all the electricity we could ever use. The computer age of today is NOTHING compared to what could have been...if the human race went another way in the early part of the 20th Century. The great EVENT is the failure of Wardenclyffe. We came so close to the threshold of Utopia and very few people even understand this historical fact. Sadly, science books still ignore Mr. Tesla. There will not be documentaries concerning the anniversary of what would have been Tesla's most incredible achievement. We continue to not give credit to Tesla. The public is not educated on all that Tesla accomplished. Tesla has the radio patents; not Marconi. Tesla invented our AC system, not Edison. Television was Tesla's invention and should be called Teslavision. Yet, there will not be science specials airing on television honoring Tesla. We are mainly unaware of the events of a century ago. The success of Wardenclyffe would have changed the world and improved the planet a billion times over! Wardenclyffe began construction on Long Island, New York in 1900. Tesla chose this location because of the large population that his Magnifying Transmitter would service. Tesla went to amazing lengths to personally build this thing of the future. The famous architect Stanford White designed the non-technical architecture of Wardenclyffe. The 200-foot tower is often photographed in its unfinished, skeleton state. In 1905, Tesla ABANDONED his ultimate dream; this ultimate achievement. Why did Tesla stop his life's work? Was he told that we are not ready for such a quantum leap? The power tower may have been beyond the grasp of adaptable humans. Did Tesla realize that what can power cities could be perverted into weapons that could destroy cities? The electrical towers could destroy continents. In 1905, the First World War was in the wind. Arthur Mathews reports that German scientists could have misused the great Transceiver. The possibility existed that the Earth could be SHATTERED by a build-up of resonance via the Magnifying Transmitter. The powerful device must be in the hands of rational, positive people. Tesla now understood or was told to dismantle his beloved Wardenclyffe tower. He had to undo the crowning achievement of his life's work. To speculate; maybe Tesla did not want the responsibility of creating a doomsday weapon and it being in the hands of madmen? We still are not ready to control the Force...not until humanity matures and stops being destructive. We may have a long wait. What wonders could have occurred to the human race on Earth if Tesla's wireless dream would have come true? There is the actual possibility of the unifying of races, nationalities and differences of cultures. Walls between countries would be entirely nonexistent. In fact, the idea of 'countries' would tend to evaporate. With free and easy planetary communications, such as World Television, people might think of themselves as 'one-worlders.' A global community could unify the people of Earth. Besides the incredible, wireless hardware and machines of this New Age...Tesla's World System of Tomorrow promotes peaceful relations between countries. Wars could be made obsolete. In its place would exist a World-Oneness. Tesla (like Einstein, Buckminster Fuller and other one-worlders) gives us further proof that he was a man-of-the-future. He called for the end of patriotism and nationalism. These are forces that retard human progress. Could he have been aware of a Tomorrow where his wireless principle unites the people of Earth? Is it possible that the idea of 'countries' is an old-fashioned concept that should be eliminated? Utopia might only be possible until we humans discard notions of individual countries, nationalism and patriotism. we did not have to pay for phone calls. we did not have to pay for any utilities. we could provide FREE food and end world hunger. defense budgets and war budgets would not be necessary. houses could be freely given to all citizens. corruption would not exist among authorities. there would be no need for a monetary system, advertising or commercials. there would be no government bureaucracy. Science and knowledge could be intelligently, logically and compassionately utilized for the benefit of everyone! Tesla knew that his power towers and World Grid would greatly accelerate the human condition. Wars could be technically erased from the human equation. Wars, prejudice, racism and hate could become obsolete ideas. There would be no enemy. We are all aboard Spaceship Earth in one global community. This is the future. A World Wireless is the most efficient way to gather and use natural energy. Such a system could only be possible in the hands of enlightened beings and certainly not possible in the hands of primitives. This could also be the past. Tesla's principles of EM power towers could have been utilized by the ancient Atlanteans, Egyptians and Incas. There are probably plenty of intelligent and pure civilizations in the universe which use such a sophisticated method of power generation. A Tesla World Wireless also allows for the possibility of literally BEAMING at the speed of light. An improved and improved Tesla system would evolve into pyramidal structures. With the total, scientific control of nature and physical forces...your scientists could actually invent transporter or Stargate-type travel. Another reason countries can appear to breakdown is the physical teleportation of the human being from one point on Earth to another. At the speed of light, you could materialize on the opposite side of the planet. You could exit a Stargate that was established on the Moon or Mars. You could appear anywhere out of the proper receptacle. If Tesla had been successful in the early part of the 20th Century with Wardenclyffe, and humanity had proceeded on the road to Utopia, by now in the 21st Century...we would be warping ourselves in saucers at the speed of light. Our heightened technology would have drastically raised our consciousness. There could have been another path traveled where there were NO WORLD WARS! Humanity did not have to be plunged into wars somewhere on the planet decade after decade. Technology could have solved the problems of conflict, greed and chaos. People should have had and presently have a much higher standard of Life. We have all been robbed of a technical, material paradise and very few people are aware of it. In 1939, there was the New York World's Fair with the Parisphere and Trilon. This grand spectacle showcased coming innovations to the public like: television, plastics, robotics and many more new inventions that people had never seen before. The World's Fair showed representations of the World of Tpmorrow. 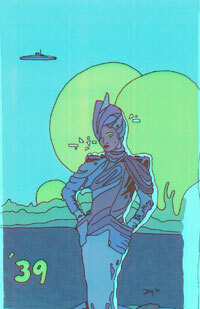 There were futuristic visions of ultra-cities and vast plans for super transports. Everything about the future, illustrated by the scientists of 1939, was clean and safe. Knowledge wins out against the struggles of humanity. Science will solve the problems of Tomorrow was the theme of the Fair. Unfortunately, the dream of Utopia in the near future was destroyed by the reality of the coming Second World War. Often War does not increase technology; they, frequently, cause Great Depressions in progress and society marches backwards. It was a hundred years ago when such a crucial and pivotal point in our technological (and you could also say spiritual) progress occurred. We went the wrong way! Instead of taking the path of enlightenment and peace...we took the path of fear, hate, war and destruction. Tesla has been edited out of the history and science books; primarily because of wireless electricity. We are not going to hear the story of how close humans came to handling the Power of the Gods in the modern age. This is an unrecognized, unknown and (yet) very important point in the course of humanity. Our civilization COULD have been very, very different than the sad and primitive state that it finds itself in presently. If Wardenclyffe would have succeeded and if we bypassed wars...today, we would be cloning; mastering anti-gravity; building on a huge scale; traveling to the stars at the speed of light and much more. Our society could have been similar to the world of Star Trek where Earthly wars have been eliminated; hate and racism have been eliminated; food is replicated; energy and knowledge have been converted to benefit everyone; and we are all bettering ourselves and improvong the human condition, etc. This article HAD to be written. SOMEBODY had to mark the coming hundredth anniversary of one of the greatest, and yet unknown, turning points in human history. In the 20th Century, we came so close to Utopia. It was just out of our reach.